Send a message – whether you want to know more details about the packages or the seasonal conditions, we are here to help. In the rare case you don’t hear back from us within 24h, please give us a shout on fb messenger! Who is behind the surf-house? In 2012 Fabian came to Taiwan to visit a friend, immediately fell in love with this island and never left since then. 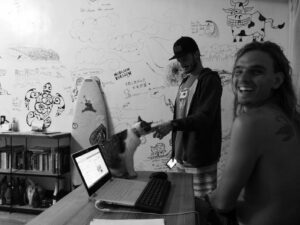 After a few years of living and surfing around the east coast and making new friends, he decided that it is time to share his know-how about this charming region and open up a place to welcome other surfers and travelers from around the world. Whoop! Really enjoyed my time at the Surf House! It’s such an amazing house with lots of cool furniture made by the host, Fabian, himself! He also seemed very knowledgeable about the local area and people, and really made sure I enjoyed my time in Dulan. Great place to stay in Dulan. Fabian is a super chill host and goes above and beyond in making sure guests have a full experience of this village. You’re going to fall in love with his dog, Lego. Coffee not bad either. Great place, great people, great Time. We could not have found something better. Thank you Fabian! Enjoyed the Surfhouse, Fabian and his staff were great. With a small group of 4 surfers we got a lot of good surfing done. The area offers lots of different breaks. Interesting local food. For me it was great to just surf, eat and sleep, and not have to think about anything else. Had a great time here. Fabian and Mark were super friendly and helpful. Only had a short stay but they made everything easy, found us some nice waves and great local places to eat and relax.